Tai Chi Hollywood offers Tai Chi group workshops and private sessions in Las Vegas of Los Angeles. Our mission is to create an environment that promotes health and well being through the practice of Tai Chi Chuan and complementary disciplines. To create a community where participants enrich their life with a simple, age-proven system that can be used anywhere and by anyone. Tai Chi Hollywood is introducing this system in the way that everyone can experience their own energy field, but more importantly, that will enable them to share this with others. 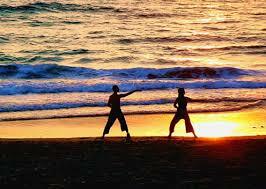 Open yourself to the secrets of this wonderful, multi-dimensional world of Internal Martial Art called Tai Chi. Learn the 47-movement short form created by Cheng Man Ching, the traditional 108-movement Yang Style long form, the traditional Yang Style straight sword form, and Push hands (Tui Shou) with its’ applications. Tai Chi Hollywood offers a schedule of classes in Tai Chi Chuan spanning a variety of levels from beginner to advanced. We also offers of workshops on Qigong, Chinese traditional approaches to health and well being, and other health practices.